OpenGov Asia is a proud media partner of IP Week @ SG 2018. Seventh year running, the event to bring together thought leaders, legal experts and innovative business owners to gain insights into intellectual property (IP) commercialisation and strategies to help expand businesses to foray the global market. 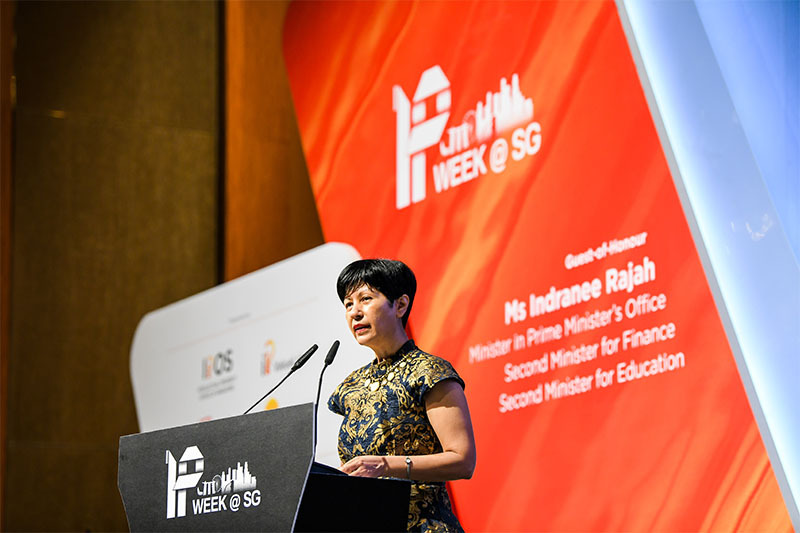 The event kicked off with welcome remarks and an opening address by Mr Darren Tang, CEO of IPOS, and Ms Indranee Rajah, Minister in the Prime Minister’s Office, Second Minister for Finance and Second Minister for Education, respectively. Their speeches anchored the relevance of IP to ride the uncertainties and opportunities in a global disruptive economy. Innovations which are being patented in recent years concentrate on technologies like blockchain and artificial intelligence. Ms Indranee Rajah rightly pointed out that tech companies are overtaking the traditional top ten companies which once belonged to the oil and gas, and manufacturing industries. Unlike the leaders of the past, tech companies create capital not with physical assets like factories or oil fields but leverage on intangible assets. Software, databases and branding are choicest assets for any company today. With the volume of innovations expected to swell, a simultaneous increase in patent and trademark filing will follow suit. Furthermore, if economies want to thrive in an innovation driven economy, businesses must be proactive in filing for intellectual property protection services. Moreover, in a globalised economy, companies must be bold in taking their assets abroad to venture larger and untapped markets. Necessarily, they must be keen on drafting a comprehensive IP commercialisation strategy if they wish to remain profitable. It is these beliefs which underpin this year’s IP Week @ SG conference theme – “Ideas to Assets: Connecting Markets through IP”. For a tiny island set in the sea, Singapore seeks to once again reinvent itself for changing tides in the global economy. Asia is widely touted as the next driver of growth. The major shift signals major opportunities. Not to be drowned out by the success of its neighbours or its relatively smaller population, the Republic sees itself as a hub to connect markets through IP. As a hub, Singapore will remain relevant and competitive for Industry 4.0. Nestled in Asia, Singapore will be able to provide important IP services for companies venturing into the region. Banking on its superb connectivity to international markets, Singapore is well positioned to cooperate and provide IP services. Initiatives such as accelerated patent prosecution and work-sharing arrangements include the Global Patent Prosecution Highway program and the ASEAN Patent Examination Cooperation Program seek to provide hospitable grounds for trading partners. Singapore also offers IP management and advisory services, IP training and patent search services. Ms Indranee Rajah reiterated the Government’s broad strategy for upskilling and future-readying the workforce and enterprises. To help companies turn their intangible assets into tangible value, the Government has penned attractive policies to assist them. For starters, under the 2018 Budget, companies can expect to receive more tax breaks for registering new IP rights and licensing payments for the commercial use of IP. Secondly, companies may receive IP strategy and management advisory services from the IP ValueLab, a subsidiary of IPOS. Thirdly, IPOS is working with industry partners to raise the awareness of IP litigation insurance in an effort to defray costs. The insurance is imperative as hefty litigation fees often deter companies seeking to enforce their IP rights thereby compromising their profitability. Governments in tandem with businesses should work to undertake a comprehensive IP management and strategy. Singapore IPOS’ current efforts are exemplary in their initiative. IP Week @ SG is organised by the Intellectual Property Office of Singapore (IPOS), IP Academy, IPOS International and IP ValueLab. The event is held between 4 to 5 September 2018, at the Marina Bay Sands Convention Centre. Associated and by-invitation-only events are held throughout the week as well. For more information, visit the IP Week @ SG site.